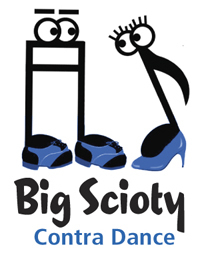 At Big Scioty’s first gathering of 2019, we were thrilled when a large number of new dancers hit the dance floor, apparently having resolved to try something fun and healthful in the new year. We hope newbies and veteran dancers alike again join us this Saturday to share in the friendly American tradition known as contra dance. The dances will be provided by Ohio’s Kathy Anderson, who is known nationally and even internationally for her smooth calling and intriguing repertoire. Expect a variety of quirky contras, along with an exciting square or two. The tunes will be performed by Athens’s Trillium, consisting of Mark Barsamian on fiddle, Hillarie Burhans on clawhammer banjo and Mark Delozier on piano.